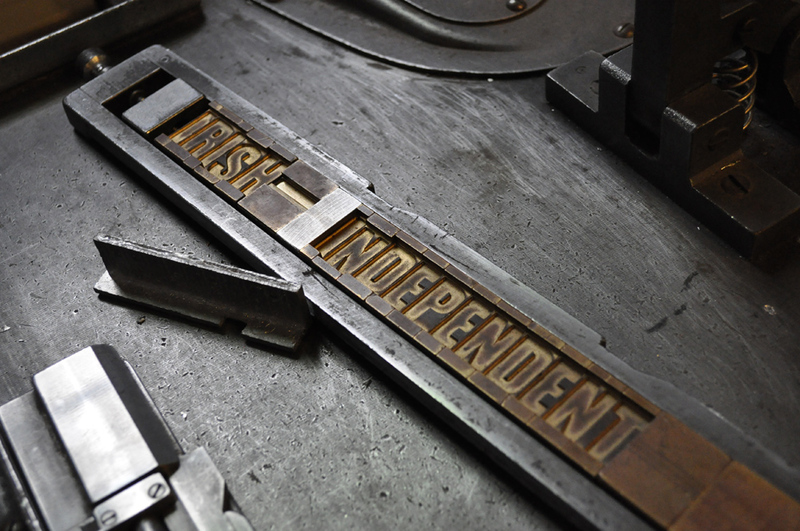 Tucked away in an old chapel, surprisingly well hidden inside a former army barracks, it is a gem of Irish printing history. Although it took a little longer for printing to arrive on the Emerald Isle (thanks in part to restrictions from the British Crown) the Irish are rightly proud of it’s strong heritage. And the museum is fine testament to that. The slightly more modern presses: a Heidseick, a Titan Glockner and a Heidelberg Windmill. The chapel has been transformed into a sanctuary for old machines, hot metal and wood type, and people who are dedicated to preserving their past. As soon as we arrived, we were greeted by a stretch of gleaming printing presses. Each one spotless and in full working order. The majority we recognised; a majestic Columbian with a chase locked up ready for use; a pristine pair of Albion presses, from different London makers; a Peerless treadle, inked up and ready for a demonstration; an immense Wharfdale Press (we'll come to that in a moment...) and a Vandercook Proofing Press (although we'd started to lose count by this point). Then there were a couple of presses new to us, the very European sounding Heidieck and Titan Glockner, which looked resplendent if not slightly dangerous. The Heidsieck, which we would have liked to see in action. As luck would have it, we arrived at the same time as a group of French students learning English, although quite how the antiquated language of letterpress will be useful for them is still a mystery. This did mean, however, that a printer was on hand for press demonstrations, and so we tagged along so see some of these wonderful presses in action. One of them being the fearsome Wharfdale Stop Cylinder press. We had seen a handful of these presses before (one being used as a very good table at The Whittington Press, and one put to slightly more traditional uses over at Typoretum), but we had yet to see one working. This particular model is a c.1856 Quad Demi, printing a massive 45" x 35". At well over three meters long and at least two wide and cast in black iron, it's certainly not for the faint hearted (or part time printers like us). There were cogs and belts, gears and levers, cylinders and rollers along the length and depth of it. It was a beast. Once it was fired up into life, the clanging and clattering was immense, and the speed of the movements was like something out of a Dickensian factory — which, in fairness, isn't too far from the truth. Health & Saftey would have a field day. Suffice to say, we won't be getting one. Just a little section of the Wharfdale press. Here is the bed of the Wharfdale, that's a whopping 45" x 35". Beyond the presses were other familiar machines. A fully functioning Linotype, with it's standard slightly sad looking lamp. As well as a Monotype caster and keyboard, and a Ludlow line caster. The museum has a workshop area for visitors to get inky. And here they have the usual selection of metal and wood type. But what was really fascinating was the Irish, or Gaelic, founts. We couldn't tell you the names of the typefaces, but it was interesting to see moveable type in a language other than the Latin letterforms we are used to. The view of the workshop composing area. Of course the other distinctly Irish museum piece was the Declaration of Independence. From a historical perspective this is momentous document, but it's also an interesting piece of printing history. The urgency to print and release the declaration meant that compromises had to be made. The headline uses wood type where some characters had to be turned new letters: an O cut to become a C, and a P with a leg formed out of wax to make an R. The printer also struggled with the quantity of metal type available to him. With so many words it had to be printed to two passes, first the top half, then the bottom. But even so, Es ran out and were replaced with a different blackletter fount half way through. 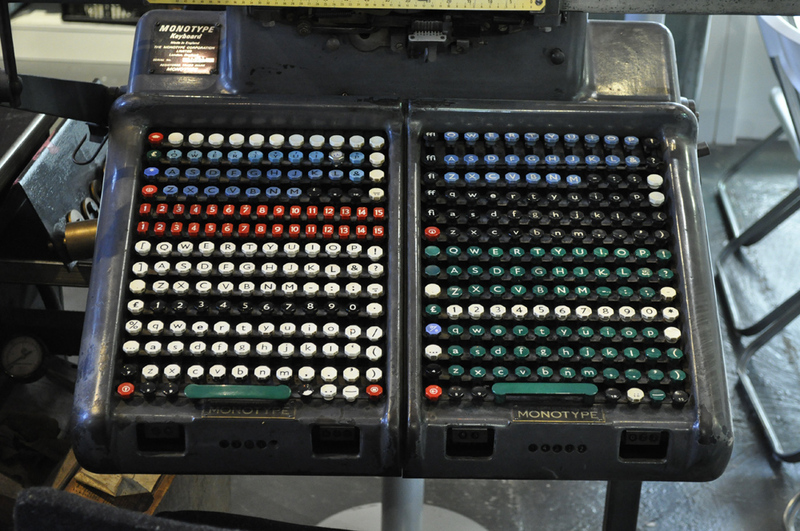 It's a wonderful insight into the challenges faced by printers at the time. And still one that foxes us today. A little snapshot of the Declaration of Independence. Look out for the r's and e's. Besides letterpress, there were further printing machines – like the press that printer, or rather drew, lined paper and ledgers. There is also an exhibition space upstairs, which when we visited had a rather niche collection of printed ephemera for local elections from the past few years. A bit lost on us we fear. But the cake at the cafe, it's safe to say, was not though... Delicious.